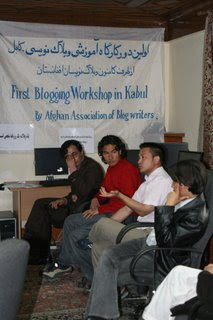 The Afghan Association of Blog Writers claims to have held the first blogging workshop in Afghanistan. (It was good enough for the Afghan Ministry of Foreign Affairs at any rate). The workshop brought together a University teacher, a poet, a journalist and various writers to discuss blogging theories and techniques as well as sharing their insights on the blogosphere. Nasim Fekrat, who runs Afghan Penlog, hopes to develop blogging in Afghanistan and says students and young people are increasingly referring to the World Wide Web despite difficulties accessing the Internet.